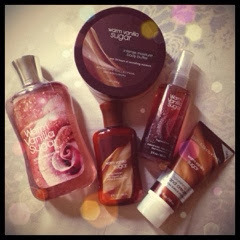 I am quite obsessed with the Warm Vanilla Sugar scent from Bath & Body Works. It started in '09 when Sheryl sent me a care package that had three travel size body lotion from B&BW. Since then I just had to have the rest of the bodycare in that scent! I bought the body lotion in the picture in Phuket, where I simply stumbled upon it in Tesco. Or was it Carrefour? Oh well, it was in one of those big supermarket. That body mist was from Watsons in Manila! The rest (including a shampoo and conditioner, remained in the bathroom because the bottles were too disgusting to photograph!) were bought online. Yes, I am THAT obsessed that I bought them online and have them shipped! Apart from the body butter, these are still unopened. I'm really just stocking up.. Saving them for a special occasion or something. But I suppose I should start using them since you're not supposed to store anything for too long anyway. So I will. Once I'm finished with my Soap & Glory Clean On Me shower gel, OPI Avoplex hand and nail cream and the 80 THB perfume I got as my work-perfume.. I'll start using these B&BW stash that I've got.